Wrinkles are no longer an inevitability of age! 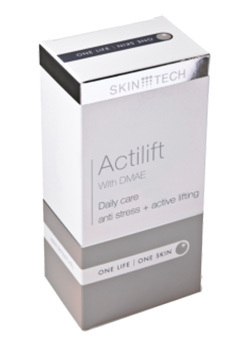 Today thanks to certain particularly active components (DHEA, DMAE, vitamin E), your skin will become truly more supple. it is the cream for the most sensitive skin.It is very fluid and penetrates without leaving a trace.Thanks to it's long term moisturising it has a real ant-wrinkle effect. • Immediate and durable moisturisation. Apply in the morning as a foundation or as a treatment of skin regeneration. • Moisturises the skin and protects against free radicals, restores balanced skin immunity. • To be used alone or combined with peelings in anti-aging treatments. This light moisturising cream, has a lifting effect on sagging,flaccid skin,contains DMAE. Anti-aging, super anti-oxidant night cream. • Prevention of skin aging. • Skin damaged by the sun or smoking. Prevention of oxidative damage after sunburn, or chemical or laser treatments. • Anti-oxidant moisturisation and/or reduction of erythema following sun exposure, laser, peeling or dermabrasion treatments. • Rapidly visible lifting effect. • Improvement of the epidermal defences and dermal moisturisation. • Inhibition and repair of collagen and elastine “cross linking” (visible tightening of the skin). Gradual durable action. • Compatible with botulinic toxin. 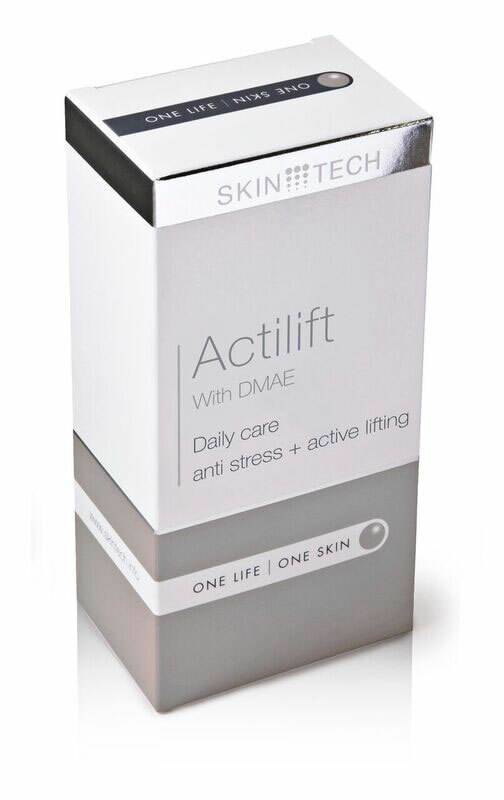 Clinical results prove it: Actilift with DMAE helps your skin gain in firmness and elasticity.The oval of your face is regained. Apply in the morning and evening during the first 4 weeks,then once a day. • Skin ageing is at last remedied all over. • Moisturises the skin,makes it smoother and firmer. • Repairs the collagen and elastin cells. • Tensor effect with progressive and lasting action. Apply in the morninng and after washing. Because the skin undergoes different aggressions in the course of time, this makes for the appearance of ungainly marks. To remove them or alleviate them sensitively, Skin Tech has perfected a very effective cream. The complexion becomes brighter and the texture of the skin more refined:your skin looks more radiant.It looks healthier. • Acquired post-inflammatory, hormone-dependent hyperpigmentations. Melasma, chloasma. • Prevention and/or treatment of hyperpigmentations, following laser treatments, peelings, dermabrasions and epilations. Use in the morning,cleanse the skin and apply the cream over the entire face. In the evening apply only to the affested regions. To be used for at least 6 months to prolong the effects of a medical bleaching treatment. Cream and gel for skins with acne. 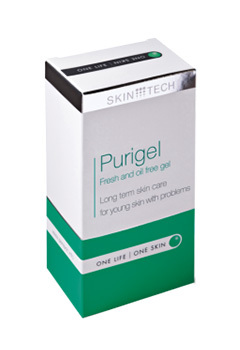 • Cleanses the skin of impurities due to teenage or middle-age hormonal imbalance. • Cream: pre-peel preparation and daily treatment to prolong the effect of medical or laser peelings in acne treatment. • Gel: long-term treatment to prolong the effect. • Decreases the secretion of sebum and closes up dilated pores. • Improves skin generation due to regular exfoliation of dead cells. Apply morning,afternoon and evening on clean skin to avoid reappearance of acne episodes. Cleaning of the skin is a necessary step for the care of the face. To have a pretty complexion the skin must be cleansed daily of environmental pollution residues, traces of make-up and the surplus of sebum which prevents it from breathing. Cleaning of the skin is a necessary step for the care of the face. To have a pretty complexion the skin must be cleansed daily of environmental pollution residues,traces of make-up and surplus of sebum which prevents it from breathing.Acleansing mouse adaptd for all skin types,even very sensitive. It's deep action conditions the balance of your skin. •Being non comedogenic,it generally eliminates all toxins . • Perfectly tolerated by skins that have become sensitive following dermatological treatments.